This Mobile Check Deposit User Agreement (“Agreement”) contains the terms and conditions for the use of Signature Bank’s Mobile Check Deposit and/or other remote deposit capture services that Signature Bank may provide to you (“you,” or “User”). Other agreements you have entered into with Signature Bank, including the Bank Services Agreement or Commercial Bank Services Agreement, as applicable to your Signature Bank account(s), are incorporated by reference and made a part of this Agreement. 1. Services. The mobile remote deposit capture services (“Services”) are designed to allow you to make deposits to your checking, savings, or money market savings accounts by scanning checks and delivering the images and associated deposit information to Signature Bank or Signature Bank’s designated processor. 2. Acceptance of these Terms. Your use of the Services constitutes your acceptance of this Agreement. This Agreement is subject to change from time to time. We will notify you of any material change via e-mail, text message, or on our website(s) by providing a link to the revised Agreement or by an online secure message. You will be prompted to accept or reject any material change to this Agreement the next time you use the Service after Signature Bank has made the change. Your acceptance of the revised terms and conditions along with the continued use of the Services will indicate your consent to be bound by the revised Agreement. Further, Signature Bank reserves the right, in its sole discretion, to change, modify, add, or remove portions from the Services. Your continued use of the Services will indicate your acceptance of any such changes to the Services. 4. Hardware and Software. In order to use the Services, you must obtain and maintain, at your expense, compatible hardware as specified by Signature Bank from time to time. 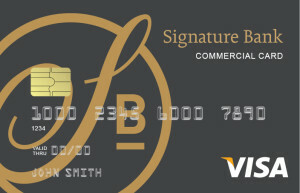 See Signature Bank.com for current hardware (such as a smartphone or other mobile device) and software specifications. Signature Bank is not responsible for any third party software you may need to use the Services. Any such software is accepted by you as is and is subject to the terms and conditions of the software agreement you enter into directly with the third party software provider at time of download and installation. FAILURE TO PROTECT YOUR HARDWARE AND SECURITY CREDENTIALS MAY ALLOW AN UNAUTHORIZED PARTY TO ACCESS THE SERVICE AND TRANSMIT AN ELECTRONIC ITEM FOR DEPOSIT. ALL USES OF THE SERVICE THROUGH YOUR SECURITY CREDENTIALS WILL BE DEEMED TO BE USES AUTHORIZED BY YOU AND BE BINDING UPON YOU. YOU ASSUME THE ENTIRE RISK FOR THE FRAUDULENT OR UNAUTHORIZED USE OF YOUR SECURITY CREDENTIALS. YOU AGREE TO (i) EXERCISE RESPONSIBLE BEHAVIOR WHEN USING THE SERVICE, (ii) FOLLOW THE INSTRUCTIONS AND RECOMMENDATIONS THAT SIGNATURE BANK PROVIDES YOU WITH RESPECT TO THE SERVICE AND (iii) USE MAXIMUM CAUTION IN PROTECTING YOUR HARDWARE AND SECURITY CREDENTIALS FROM UNAUTHORIZED ACCESS. YOU AGREE TO NOTIFY SIGNATURE BANK IMMEDIATELY IF YOU BECOME AWARE OF ANY LOSS OR THEFT OF, OR ANY UNAUTHORIZED USE OF THE SERVICE OR YOUR SECURITY CREDENTIALS. 5. Fees. A fee may be charged for the Service. You are responsible for paying the fees for the use of the Service. Signature Bank may change the fees for use of the Service at any time pursuant to the section titled “Acceptance of these Terms” above. You authorize Signature Bank to deduct any such fees from any Signature Bank account in your name. When the image of the check transmitted to Signature Bank is converted to an Image Replacement Document for subsequent presentment and collection, it shall thereafter be deemed an “item” within the meaning of Articles 3 and 4 of the Uniform Commercial Code. Checks or items prohibited by Signature Bank’s current procedures relating to the Services or which are otherwise not acceptable under the terms of your Signature Bank account. 7. Receipt of Items. We reserve the right to reject any item transmitted through the Services, at our discretion, without liability to you. We are not responsible for items we do not receive or for images that are dropped during transmission. An image of an item shall be deemed received when you receive a confirmation from Signature Bank that we have received the image. Receipt of such confirmation does not mean that the transmission was error free, complete or will be considered a deposit and credited to your account. We further reserve the right to charge back to your account at any time, any item that we subsequently determine was not an eligible item. You agree that the Bank is not liable for any loss, costs, or fees you may incur as a result of our chargeback of an ineligible item. 8. Right To Audit. We may periodically audit and verify your compliance with this Addendum. You agree to cooperate and provide information or documents, at your expense, as may be reasonably requested by Signature Bank in the course of such audit. 9. Availability of Funds. You agree that Electronic Images submitted via Signature Bank’s Mobile Deposit Services from your mobile device are not subject to the funds availability requirements of the Federal Reserve Board’s Regulation CC. In general, if an image of an item you transmit through the Service is received and accepted before 5:00 p.m. Central Standard Time on a business day that we are open, we consider that day to be the day of your deposit. Otherwise, we will consider that the deposit was made on the next business day we are open. Funds deposited using the Services will generally be made available in three business days from the day of deposit. Signature may make such funds available sooner based on such factors as credit worthiness, the length and extent of your relationship with us, transaction and experience information, and such other factors as Signature Bank, in its sole discretion, deems relevant. 10. Disposal of Transmitted Items. Upon your receipt of a confirmation from Signature Bank that we have received an image that you have transmitted, you agree to retain the check for at least 30 calendar days from the date of the image transmission. After 30 days, you agree to destroy the check that you transmitted as an image, mark it “VOID”, or otherwise render it incapable of further transmission, deposit, or presentment. During the time the retained check is available, you agree to promptly provide it to Signature Bank upon request. 11. Deposit Limits. We may establish limits on the dollar amount and/or number of items or deposits from time to time. If you attempt to initiate a deposit in excess of these limits, we may reject your deposit. If we permit you to make a deposit in excess of these limits, such deposit will still be subject to the terms of this Agreement, and we will not be obligated to allow such a deposit at other times. The current daily dollar limit is $5,000.00 per business day for retail banking clients and $75,000.00 per business day for commercial banking clients. In addition, the current monthly dollar limit is $10,000.00 per any 30 consecutive calendar day period for retail banking clients and $75,000.00 per any 30 consecutive calendar day period for commercial banking clients. There is a daily and monthly statement cycle limit on the number of items, 10 per day for consumer and business and 100 for consumer and business in any 30 consecutive calendar day period. Signature may adjust these limits up or down based on such factors as credit worthiness, the length and extent of your relationship with us, transaction and experience information, and such other factors as Signature Bank, in its sole discretion, deems relevant. 12. Presentment. The manner in which the items are cleared, presented for payment, and collected shall be in Signature Bank’s sole discretion subject to the Bank Services Agreement or Commercial Bank Services Agreement governing your account. 13. Errors. You agree to notify Signature Bank of any suspected errors regarding items deposited through the Services right away, and in no event later than 30 days after the applicable Signature Bank account statement is sent. Unless you notify Signature Bank within 30 days, such statement regarding all deposits made through the Services shall be deemed correct, and you are prohibited from bringing a claim against Signature Bank for such alleged error. 14. Errors in Transmission. By using the Services you accept the risk that an item may be intercepted or misdirected during transmission. Signature Bank bears no liability to you or others for any such intercepted or misdirected items or information disclosed through such errors. 15. Image Quality. The image of an item transmitted to Signature Bank using the Services must be legible, as determined in the sole discretion of Signature Bank. Without limiting the foregoing, the image quality of the items must comply with the requirements established from time to time by Signature Bank, ANSI, the Board of Governors of the Federal Reserve Board, or any other regulatory agency, clearinghouse or association. All information you provide to Signature Bank is accurate and true. You agree to indemnify and hold harmless Signature Bank from any loss for breach of this warranty provision. 18. Termination. We may terminate this Agreement at any time and for any reason. This Agreement shall remain in full force and effect unless and until it is terminated by us. Without limiting the foregoing, this Agreement may be terminated if you have not made a deposit within 60 day window, if you breach any term of this Agreement, if you use the Services for any unauthorized or illegal purposes or you use the Services in a manner inconsistent with the terms of your Bank Services Agreement, Commercial Bank Services Agreement or any other agreement with us. 20. Ownership & License. You agree that Signature Bank retains all ownership and proprietary rights in the Services, associated content, technology, and website(s). Your use of the Services is subject to and conditioned upon your complete compliance with this Agreement. Without limiting the effect of the foregoing, any breach of this Agreement immediately terminates your right to use the Services. Without limiting the restriction of the foregoing, you may not use the Services (i) in any anti-competitive manner, (ii) for any purpose which would be contrary to Signature Bank’s business interest, or (iii) to Signature Bank’s actual or potential economic disadvantage in any aspect. You may not copy, reproduce, distribute or create derivative works from the content and agree not to reverse engineer or reverse compile any of the technology used to provide the Services. 21. DISCLAIMER OF WARRANTIES. YOU AGREE YOUR USE OF THE SERVICES AND ALL INFORMATION AND CONTENT (INCLUDING THAT OF THIRD PARTIES) IS AT YOUR RISK AND IS PROVIDED ON AN “AS IS” AND “AS AVAILABLE” BASIS. WE DISCLAIM ALL WARRANTIES OF ANY KIND AS TO THE USE OF THE SERVICES, WHETHER EXPRESS OR IMPLIED, INCLUDING, BUT NOT LIMITED TO THE IMPLIED WARRANTIES OF MERCHANTABILITY, FITNESS FOR A PARTICULAR PURPOSE AND NONINFRINGEMENT. WE MAKE NO WARRANTY THAT THE SERVICES (i) WILL MEET YOUR REQUIREMENTS, (ii) WILL BE UNINTERRUPTED, TIMELY, SECURE, OR ERROR-FREE, (iii) THE RESULTS THAT MAY BE OBTAINED FROM THE SERVICE WILL BE ACCURATE OR RELIABLE, AND (iv) ANY ERRORS IN THE SERVICES OR TECHNOLOGY WILL BE CORRECTED. 22. LIMITATION OF LIABILITY. YOU AGREE THAT WE WILL NOT BE LIABLE FOR ANY DIRECT, INDIRECT, INCIDENTAL, SPECIAL, CONSEQUENTIAL OR EXEMPLARY DAMAGES, INCLUDING, BUT NOT LIMITED TO DAMAGES FOR LOSS OF PROFITS, GOODWILL, USE, DATA OR OTHER LOSSES RESULTING FROM THE USE OR THE INABILITY TO USE THE SERVICES INCURRED BY YOU OR ANY THIRD PARTY ARISING FROM OR RELATED TO THE USE OF, INABILITY TO USE, OR THE TERMINATION OF THE USE OF THIS SERVICES, REGARDLESS OF THE FORM OF ACTION OR CLAIM (WHETHER CONTRACT, TORT, STRICT LIABILITY OR OTHERWISE), EVEN IF SIGNATURE BANK HAS BEEN INFORMED OF THE POSSIBILITY THEREOF. Your Mobile Deposit Application has been sent.